The New York Yankees and chiropractic have been in the news the past few weeks thanks to major-league baseball player Johnny Damon. In most recent news, the New York Times reported earlier this week that the Yankees would be hiring a team chiropractor, apparently on the advice of Johnny Damon. 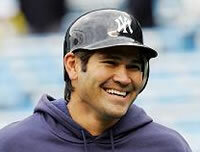 There were several articles circulating in the news about Johnny Damon and the chiropractic care he has been receiving in Orlando, Florida. According to Damon, his chiropractor is amazing. The New York Yankees center field ballplayer hopes his chiropractic care will translate into better results on the field, not only for himself, but for his team. This wouldn’t be the first time the New York Yankees have utilized the team chiropractor. Back in May of 1934, a magazine from the National Chiropractic Association featured a front-page photo of New York Yankees team chiropractor (Dr. Painter) working with a ballplayer, with Babe Ruth watching on. I don’t know if there’s any truth of this, but I once heard that at the time, the New York Yankees asked the New York Daily News to keep quiet about the Yankees having a team chiropractor, which was from the 1920s to the 1930s. Apparently, they wanted to maintain a competitive edge by keeping the chiropractic care a secret. Perhaps coincidentally, the Yankees recorded their best season ever (1927 – World Champions) and won four World Championships (1923, 1927-1928, 1932) during the time of Dr. Erie Painter, chiropractor. According to various news reports, Johnny Damon has not spent a single day on baseball’s disabled list during his lengthy playing career. You can visit the official Johnny Damon web site at johnnydamon.net to view his bio, long list of awards and records, as well as some very impressive statistics. Thanks to an integrated medical team of orthopedists and internists, certified athletic trainers, chiropractors, massage and physical therapists, the Boston Red Sox organization actively practices injury prevention in anticipation of a winning season in 2007. Competing at an exceptionally high level, both players and staff cover all their bases when it comes to maintaining optimal health, with chiropractic adjustments contributing to the overall fitness of the organization. With a demanding schedule that includes seven weeks of spring training, 162 games, and potentially weeks of play-off games or a World Series, Rowe cites the importance of keeping players in top physical condition for every game as well as between games. He says that the most common problems among baseball players are rotator cuff injuries, neck, mid-back and lower back conditions, as well as hamstring pulls, which occur from running full out from a standstill position.